In a 9- x 13-inch baking dish, combine butter and brown sugar; mix well. Place bananas in butter mixture and brush to coat completely. Place bananas on grill flat-side down, and cook 4 to 6 minutes, or until edges begin to bubble; turn with a long-handled spatula and cook 2 to 3 more minutes, or until lightly browned. 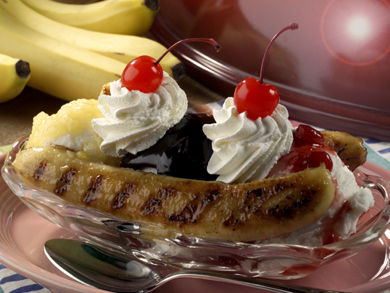 Place 2 cooked slices of banana in each of 6 serving dishes, top with scoops of ice cream, and drizzle with hot fudge. Serve immediately. You can heat the hot fudge in an aluminum container directly on the grill. If you'd like, crown this with all your favorite banana split toppings, or, for a change of pace, replace the hot fudge with caramel sauce and sprinkle each serving with crushed peanut brittle.